The term brand stretch refers to how far a business can stretch its products or services into new and unrelated markets successfully. Think Yamaha, originally a musical instrument manufacturer, launching into the unrelated motorbike market. The less extreme variation of a brand stretch is a brand extension, where an existing brand launches a new or modified product into the same broad market. Think Coke launching Coke Zero, or Sanitarium, the WeetBix parent, launching Up&Go to the breakfast market. Both a brand stretch and a brand extension can be a lucrative way for a brand to increase its revenue and customer base, but both carry inherent risks. A business that stretches its product or service offering too far can leave consumers confused and alienated; and operating in an unknown territory can result in your brand fighting against entrenched competitors more experienced in that market. Before deciding to move forward with a brand stretch that takes your business into new markets, we’ve outlined three key questions for consideration. 1. Brand stretch or brand extension? 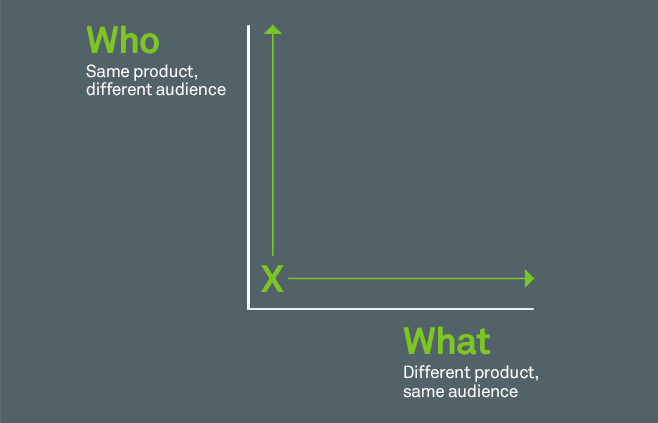 While ascertaining exactly how far a brand can stretch into new product lines or markets can be more of an art than an exact science, the chart below provides a useful tool for evaluating risk. The alternative approach is a larger shift, a brand stretch, but mitigating risk by continuing to cater for the same audience while broadening the product offer - i.e. change the what. An example of this is the construction brand Caterpillar. Caterpillar was originally a construction and mining equipment brand, before stretching its brand into safety footwear for worksites – an entirely different category of product, but the same core construction and worksite employee audience. Another example is Porsche sunglasses, an entirely different category being sold to a similar, highly affluent, image-conscious audience. While both of these options contain inherent risks, an even bigger risk lies in changing both the audience and the product i.e. the what and the who – at the same time. This move represents the furthest brand stretch and is the most likely to cause confusion in both current and targeted consumers. 2. Is there an appropriate level of brand equity within your existing brand? Once the business has evaluated whether a new product line or new target market presents an opportunity for growth, it needs to consider the strength of the equity that currently exists within the brand. A successful brand stretch or brand extension is able to leverage the brand equity that already sits within the parent brand. Leveraging that existing equity will ensure the new product is immediately credible and is recognisable by its target audience. The ability to leverage existing equity also delivers the benefit of allowing the new product or service to bypass the heavy investment traditionally required to build a profile from scratch. An excellent example of a brand extension that successfully leveraged the brand equity within the parent brand is Dove and Dove For Men. Originally launched in 1957, Dove’s positioning has evolved over time to become synonymous with real, honest, caring skincare for women. Building on the strength of its range of products for women, Dove decided to leverage its brand equity to target the men's grooming market by launching a new line for men - Dove Men+Care. The launch of this new product range took place in 2010, more than 50 years after Dove was established. By driving awareness of the Dove product line through the ongoing and consistent application of the brand and its unique point of difference, Dove had successfully established itself as the market leader in skincare. Only then, with sufficient awareness and brand equity, did they apply this expertise by extending their skincare expertise to a new audience. It’s vital that a brand is truly established within its existing market if it is to provide sufficient brand equity to a new product or service. Without sufficient awareness and understanding of the existing product or service, the new product will fail to appear credible. This is even more important for a brand stretch. In the example of Caterpillar, the CAT brand had built a strong and firmly embedded reputation as construction and mining experts who understand the specific needs of a construction environment. They had built a brand based on strength in a rugged workplace, around the idea of being unbreakable. Caterpillar was able to successfully carry across the equity it had built around these characteristics, characteristics that resonated with its audience, into the new category of footwear. 3. Will customers trust you in this space? Put another way, is our expertise valued in our new market place? The Apple iPhone is a story of a brilliantly successful brand stretch, moving Apple from the computer market into the telecommunications market. When the iPhone launched in 2007 Telstra’s COO at the time, Greg Winn, when asked if he viewed the new product as a threat, is quoted as having said "There's an old saying - stick to your knitting - and Apple is not a mobile phone manufacturer, that's not their knitting,". Nine years on and it’s clear what Greg Winn failed to understand. While Apple was at the time called Apple Computers, they weren’t just experts in computing but rather technology supported by excellent design, two characteristics of remarkable value in the mobile phone space. Apple’s brand positioning centres on ‘humanising technology’ – a positioning that can apply equally to mobile phones as it can to computers. Additionally, the success of Apple’s iPod bridged the brand stretch between computers and mobile phones, making the ‘leap’ in the consumer’s mind more manageable. This provided consumers with a reason to trust Apple in this new market, resulting in the most successful product launch in history. Another example of the importance of consumer trust is the failed McDonalds’ failed brand extension into Italian restaurants. In 1999 McDonalds attempted to transfer their success in American fast food restaurants to reach a broader audience by opening a number of pizza restaurants. Famously this brand extension failed to gain traction - but why was this? The answer lies in McDonald’s perceived expertise. The public accepted McDonalds’ authority in burgers but was unable to trust that this expertise could carry across successfully to the pizza and pasta space. Any business considering a brand stretch or brand extension, whether B2C or B2B, must understand consumer perceptions of its expertise and question whether the new direction provides consumers with a reason to trust the brand in its new chosen field. To understand how to approach gathering information on your customers and how they perceive your business download our Guide to Brand Research. Both a brand stretch and a brand extension can be seen as an invaluable opportunity for growth. Yet transferring the brand equity and consumer trust from an established brand to a new offering is often a difficult exercise. Brand stretch should not be seen as a short cut to growth, but should be treated cautiously, and with brand equity and customer sentiment front of mind. An interesting example of brand stretch to conclude with is eHarmony’s foray into recruitment. eHarmony has launched ‘Elevated Careers by eHarmony’, applying the same scientific methods its uses to match couples to matching employers with their next employee. Here eHarmony has evolved both the ‘who’ (from singles to employers and job hunters) and the ‘what’ (finding love to a finding new job) – but it’s an evolution, not a wholesale change. In each example, eHarmony uses your personality and personal characteristics to find a solution tailored to your specific needs. There is no doubt that there is equity in the eHarmony brand – the site is responsible for around 4% of marriages in the US each year. But can they translate the trust consumers place in them to find them a partner into trust to find them a new job or a new employee? Will the recruitment marketplace value their online dating expertise? Can the brand achieve the growth it’s seeking via this ambitious brand stretch?